Commissioned by Amy Johnson Festival for their exhibition 'Da Vinci Engineered - Renaissance Mechanics to Contemporary Art'. An installation in response to the themes of flying, engineering and Amy Johnson's life. 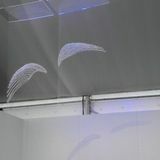 A two-dimensional drawing 'hatches' into the third dimension: A stylized pair of wings is drawn/stitched on a horizontally suspended sheet of acrylic glass using black waxed thread. This 'drawing' builds the matrix for a bundle of invisible threads joining two acrylic sheets above our heads. Sewn to the vertical threads, a three-dimensional pair of wings (mohair) unfolds.